Hey there friends! !I know, I know. I've been talking about this Hammer review and giveaway for a while and the day is finally here. I sit home with two kids with pink eye and me with strep throat so why not!! 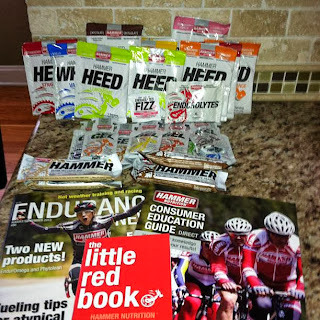 I was introduced to Hammer products through a FB page, WRC-Ultra Running Club. It's no secret to my hubby or close friends that I am eyeing up an Ultra in the near future and these ladies rock them out like an easy 5K run on a weekday! They are such an inspiration and a wealth of knowledge and I feel lucky to be on the page. Enough gushing over that. I've been running for about 4 years now. The first race I ever trained for was a half marathon so I've been testing out Gu's,gels and chews for a long time. I practice with them on my long runs which tend to be on a Thursday for me and always found that I felt good during the run but for the rest of the day, I suffered from intestinal issues. I've always heard about Hammer products, seen them at a few races but never got around to trying them. I was convinced after reading a bloggers review of her ultra and the replacements she was taking during her run. I gave Hammer a call and chatted with one of their fantastic customer service people about the distances I run, my weight and my stomach. She recommended I take half a gel during my long runs or JUST the HEED fluid replacement. HOLY SMOKES is what I thought when I got it in the mail. 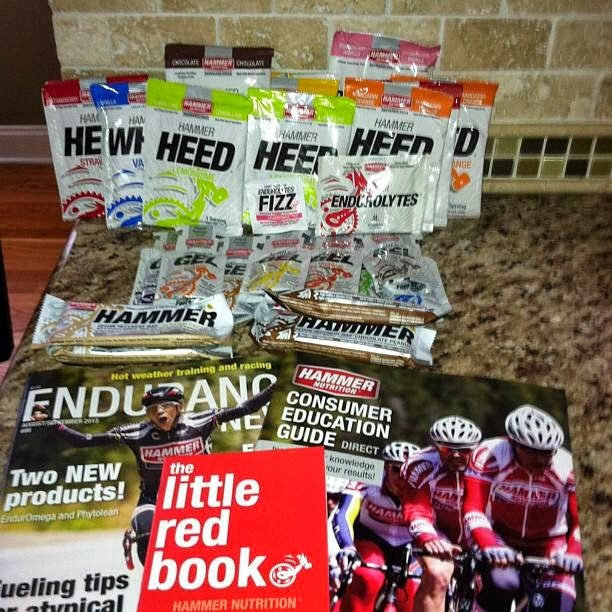 All the information I could get about Hammer Nutrition and tons of products to try. So I began to try them. What I'm digging right now: I LOVE the apple cinnamon, banana and tropical gels. I think since I run so early in the AM that they feel more like breakfast gels than the chocolate and espresso. I like those too but prefer the others. I love the recovery bars and the HEED is good when mixed right. The little Red Book is probably the best thing I could get. I explains each product, it's uses and how to determine the right mix for your activity. Here's the best part....... NO STOMACH issues. I have run with the gels for about 2 months now and unless I am dehydrated, I am not having the issues that I was after my long runs. I'm sold on these and even though I can go online and order the products, I prefer to call them and chat with them on the new products they have coming out or their personal recommendations. So here's what I'm going to giveaway. There are two gels (Espresso and Chocolate), a Melon HEED, Vanilla Whey and a Vegan Recovery Bar (almond cacao). Thought I would share the love and pass along a few of my favorite things!! If you can't wait or you don't win contact them and use code: 222037 for 15% off your first order along with free shipping. I prefer to call them but if you are an online kind of person go to Hammer Nutrition. I like the chocolate flavored gel :). That's the only thing I've tried from them though, so I'd love a chance to win and try more. The chocolate is good. Good luck! I am always very afraid to try new ones. These have been wonderful for my stomach. No issues! I've not tried Hammer products. I'd love to though! Thanks for hosting the giveaway! I haven't tried them before! I've never tried Hammer products before. They sound great! 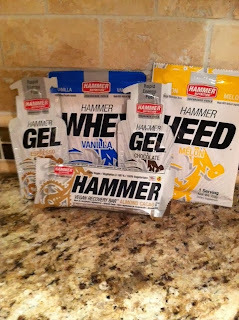 I got Hammer gels at a practice swim and a race this summer, and liked them, so I've been buying them here and there and would love to try their other products.There's a blackberrry or something berry that I like best! I haven't try it before. But I love to try them. I have never used their product... I'd love to try the gel! I haven't tried them yet but I sure would love to have that opportunity! I've never tried the Hammer products before. I saw them handed out once at a run that I wasn't doing though.